Shelter Island's South Ferry travels from the South Side of Shelter Island to North Haven, which is near Sag Harbor. You may contact them at 631-749-1200. 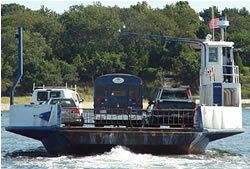 The five minute ferry ride is available year round and carries cars and passenger trucks. A fun way to enjoy Shelter Island is to charter the ferry and simply bring your own bus. Guided tours of Shelter Island are provided and all you do is drive your bus with all your passengers on the ferry and prepare yourself for an adventure. You can stay on the bus, walk around the ferry, or do whatever you want. The guided tour allows you to get a vantage point of Shelter Island that is not the same view you would get if you were trying to tour the island on your own. Call the South Ferry office at 631-749-1200 if you are interested in chartering the ferry for a field trip, family reunion, or any other type of outing with a group. You can charter the ferry for private parties as well. Whether it is a birthday party, wedding reception, anniversary, or any other type of celebration having the party aboard one of the South Ferries is perfect. South Ferry will arrange catering and music if you so desire and accommodate your guests aboard one of the ferries. This is certainly a way to celebrate that won't soon be forgotten! Two weeks notice is requested.